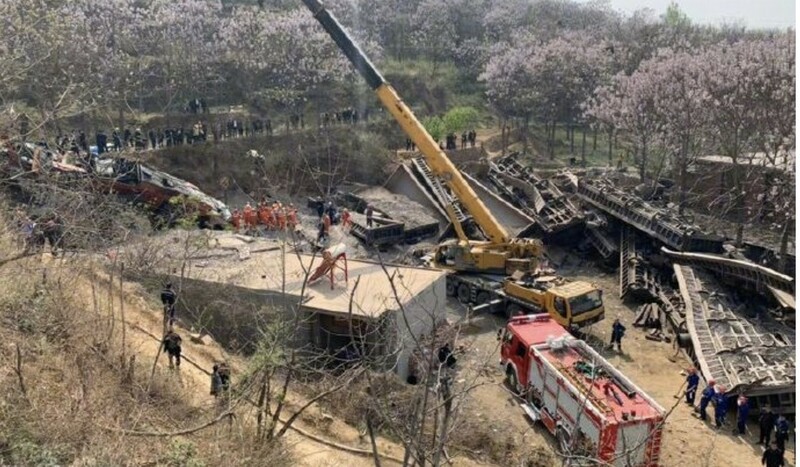 At least four people were killed in central China on Wednesday night when a freight train carrying aluminium ore derailed and crashed into a house, local authorities said. Two people were still missing after the incident, which happened about 10pm in an area of Gongyi, Henan province, the city government said on Thursday. The 25-wagon train, with a total weight of 2,350 tonnes, was travelling along a 22km (14-mile) line built specifically to transport aluminium across the city. While the exact cause of the derailment is unknown, the authorities said on Weibo – China’s Twitter-like platform – that the train, owned by a subsidiary of Aluminium Corporation of China, lost control as it was travelling on a downhill section of the line. The train’s locomotive and first 13 wagons left the track and ploughed into a house, trapping four members of its crew and two members of the public, the report said. After using cutting machines and cranes to remove sections of the train, rescue teams pulled the bodies of four victims from the rubble on Thursday afternoon, Zhengzhou Daily reported. Efforts were ongoing to locate the two people trapped, it said, without identifying the people killed or those still missing. The aluminium company issued a statement saying it had suspended all activity on the line, which has been in operation since the 1950s.